A record of my time consuming hobbies. I have been working in Wyoming for 2 months now and it is going great! My job is pretty simple, I help all car dealerships in Wyoming. It is a great field to be in right now because all the car dealerships need serious help! But enough about work. I don't think there is a better state in the country for me to live. The outdoor opportunities are endless. Of course I have already began to scout out all types of hunting and fishing. We have a home under contract that has room for horses. It also has fourwheeler/snowmoblie trails right out the backyard! 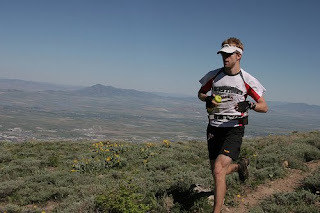 There are also some great ultra marathons in Wyoming This year I have my eye on the bighorn 50 and a return trip to Utah to run Katcinamosa again, with a better result this time. I'll post more in 5 months. ha ha. Well I am way behind here so I'll try and catch up a little. I completed the Logan Peak trail run which was my first ultra marathon this summer! It was a great race. 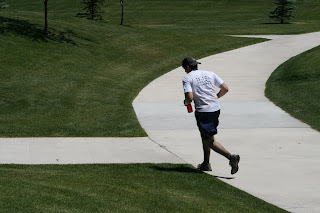 It started at a park in smithfield UT. and headed straight up the mountain from there! It followed the cyncline trail to the summit of Logan peak and made a big loop around the mountain and finished back at the park in Smithfield. It was 28 miles of beautiful high mountain scenery! 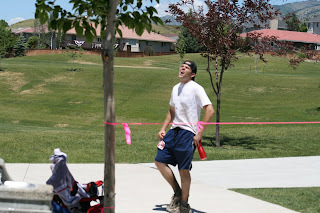 Though the distance wasn't much longer than a standard marathon, the terrain was rough! it was almost all on single track mountain horse trails, and the course had 14,000 feet of elevation gain and loss! Heart break hill would feel like a small speed bump compared to that. It was a tough race because I had the flu and I struggled with stomach problems the whole time. It was slow going for me but I finished in 7:56. I should be able to take an hour off that next year I think. There is a small traffic jam at the first aid station in dry canyon . Here I am on the go! This is Brian, it is a nice picture of the scenery. There was quite a bit of snow near the top, this was in June! Here I am rounding the corner to the finish! It feels good to finish! I am putting this one here so that Jake will read it and write the real version to the story. About three weeks ago, Jake was out running (I think, he may have been hunting) either way he was out on the mountain and look over a few hundred yards and saw something sitting under the tree, so he took out his binoculars and saw a bear!!! That would be a sight to see, a single bear sitting under a tree!! This mountain is a great place to run! This week I ran up and down the Timpanookee trail twice. I didn't make it to the summit on Tuesday because it would have made me late for work. I headed out again wendsday and made the round trip in just under 4:30 hours. It is a beautiful trail and the view from the top is awesome! Here is a picture of me in the basin wich is one of the most beautiful spots on the mountain. 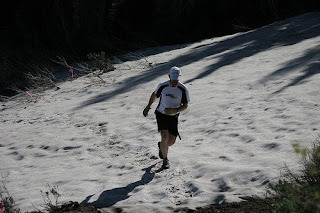 I have spent all spring and summer preparing for the Katcina Mosa 100K Mountain run. 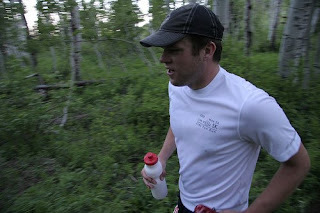 It is a 63 mile grueling mountain run on dirt roads and trails. It has almost 14,000 feet of elevation gain and loss!